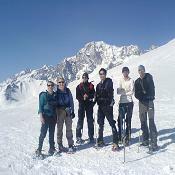 Spend a full week snowshoeing in the western Alps, staying in huts each night, and snowshoe in three countries; Switzerland, France and Italy. 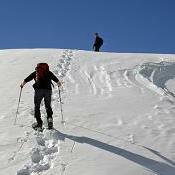 There are five days guiding and four nights on a half board basis in mountain huts, and a night B&B at each end. 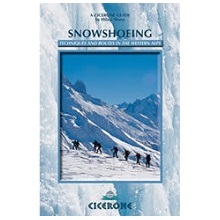 The itinerary has been built to link three iconic snowshoeing regions; with trek nights spent in the Grand Saint Bernard monastery / Champex-Lac in Switzerland, the Refuge du Loriaz above Vallorcine in France, and the Rifugio Bonatti in the Val Ferret of Italy. Snowshoeing is now officially the fastest growing winter sport, and our team of guides cannot wait to show you why. If you only have a week to spare, then this visit to the Alps will blow your mind, and you can take in several snowshoe summits too. 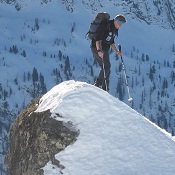 As well as enjoying a great week of snowshoeing, we aim to teach you the key safety skills for route planning and winter Alpine journeys, with a lot of weight put on avalanche prediction and reaction, as well as the selection of appropriate Alpine equipment. 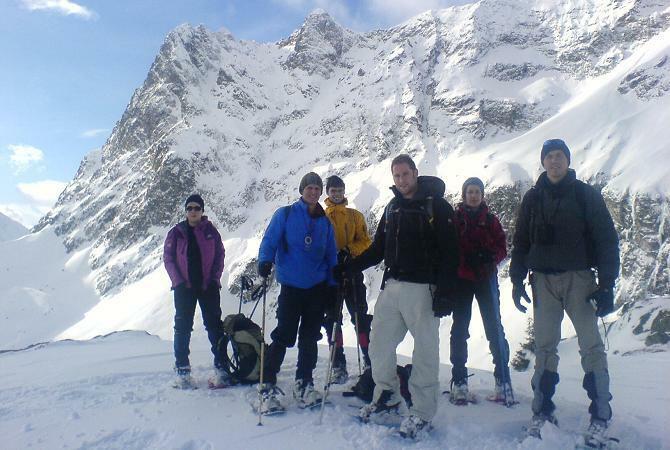 This course really appeals to those who want to explore different regions of the western Alps, and to stay on a half board basis in the huts after each day of snowshoeing. It enables you to really immerse yourself in the area, and to enjoy the best routes! 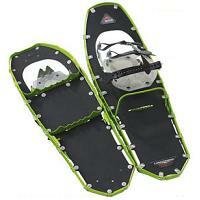 Don't worry if you have never snowshoed before, as you will pick up the skills quickly. All you need is to be fit for hill walking, to have a sense of humour if you fall into a soft snowdrift, and to love the outdoors. We can teach you the rest, and you are guaranteed a great holiday that you won't forget for a very long time. One of the delights of snowshoeing is that, unlike skiing or climbing, you can go out in all levels of visibility and snowfall, and have a great day. This region of the Western Alps is blessed with hundreds of great snowshoeing areas, and so the itinerary can be flexed on any day to take account of better weather or snow conditions, to ensure that you sample the best on offer. The itinerary below is to provide you with a taster of what you could achieve, and isn't fixed in stone. We get many clients who come back year after year to repeat this course, but they need never repeat a route they have done before. Your guide will have a massive local knowledge and experience. Travel to Chamonix to arrive for the 17:00 check-in followed by and course safety and itinerary briefings. There is time for kit checks or rental of equipment (see inclusions below for what you are provided as part of the course price). 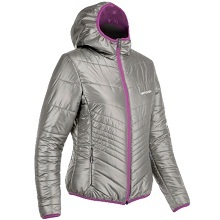 Briefings are over by 18:00 and the Chamonix hosts accompany the group to pre-dinner drinks. Some clients opt to travel out a day or two early to get their hill legs back and to explore the town. Night in Chamonix. After meeting your guide in the morning, you are driven into Switzerland via Martigny. 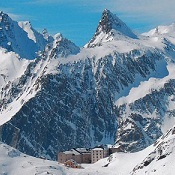 The objective is dependent on the snow and avalanche conditions, and popular choices include the Grand Saint Bernard monastery via Col Ouest du Barasson, or Mont de l'Arpille from La Ravoire. 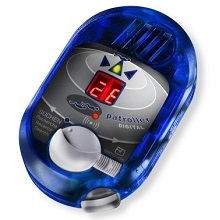 Before you start your snowshoe trek, you are trained on snowshoes and the use of avalanche beacons. The night spent half board in Grand Saint Bernard Monastery / Champex-Lac. 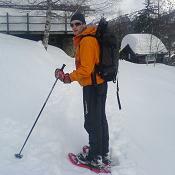 You are woken, and after breakfast, you head out to tackle one of the classic snowshoe summits or high passes nearby. 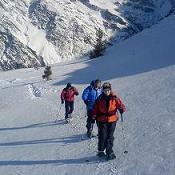 Objectives from Saint Bernard include Mont Fourchon, or the Three Cols route. From Champex-Lac there is a great choice of trails above the Entremont valley towards the Tour de Bavon. You return to the monastery / gite for a second night, again on a half board basis, as you are for the next two nights too. After waking again in Switzerland, you set off to snowshoe down to the valley floor, where you transfer back into France and the Vallorcine valley. The snowshoes are put back on, and you ascend through the forests to reach the high alpage of Loriaz, surrounded by a crown of mountain peaks. The refuge is an old farm, and offers us cosy and traditional lodgings for the night, as well as great local food. Half board and night in Refuge du Loriaz. In the morning you ascend to a summit such as Tete du Chevrette or Le Charmoz, to watch the sun rising over the glaciers of Le Tour, Argentiere and Geant. 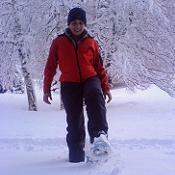 You then plunge steeply down in deep snow, back a different trail through the woods to the village. From here you drive through the Mont Blanc road tunnel into Italy, and snowshoe up the Val Ferret. At the head of the valley you ascend to the luxurious hut. Half board and night in Rifugio Walter Bonatti. Today is the final snowshoe trek, and you leave the hut far below to reach the Pas Entre Deux Sauts for an amazing view of Mont Blanc in the early morning. You descend back to the hut, and then onwards down to the valley floor. It's always recommended to get a steaming Italian hot chocolate in the Cafe Lavachey! 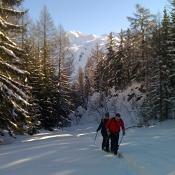 You then return to Chamonix after the snowshoeing for a celebratory meal, with the final night spent in Chamonix. Breakfast, then accommodation check out at 10:00, after which you are free to depart for home. If you feel you require any feedback, please ask your guide or the resort team. Inclusions: 1) UIMLA / IFMGA guide for five days, 2) Alpine course hosts for logistics & briefings, 3) Pre course information booklet, 4) Equipment discount voucher for UK shops, 5) Two nights B&B accommodation in Chamonix (inc. bedding & towels) and four nights half board accommodation in mountain huts in Switzerland / France / Italy, 6) Free 36 page technical Course Instruction Booklet, 7) Road transport to and from start and end of snowshoe treks, 8) Logistics support and briefings, 9) Equipment hire of snowshoes, avalanche transceiver, probe & shovel. Exclusions: 1) Travel to and from Chamonix, 2) Personal laundry, telephone calls, lunches, evening meals at each end of the trek, & any purchases in mountain huts / hotels / restaurants, 3) Cable cars and mountain uplift, though not normally required, 4) Activities insurance, & excess baggage charges. Group sizes: 2 - 8 people per UIMLA mountain guide. For group sizes of over 8 people, there are multiple guides, and the teams travel independently of each other. 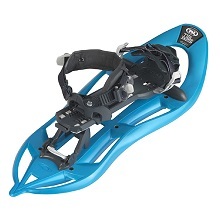 Notes: The loan of all technical equipment for each client is included in the course price as required: snowshoes, avalanche transceiver, avalanche probe and shovel. 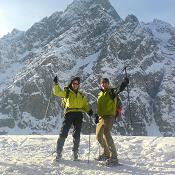 A great choice of bases that we stayed in that gave us access to brilliant snowshoe treks and summits. Thank you for all the organisation and the top guiding. Please pass on my thanks to Kingsley who guided us, for looking after us so well, and his incredible local knowledge. We will be back next year for more! An article written about the Swiss part of this adventure, written by one of our snowshoe guides, which gives a real insight into the diverse history of the region, and the ascent of Mont Fourchon. You'll also learn a lot about the background to the monastery, and how it came to be built - Link to article. We have a team of over 30 IFMGA guides, and a resort support team, who all want you to have the best snowshoeing possible! For more details on the guiding team and qualifications, please click here. cost over £100 extra for the week! All the trek nights are half board in mountain huts, with a B&B night at each end, so you can keep a tight control on costs. What you see is what you get. There are NO extra hidden costs. A key part of choosing a company is being able to come and talk about your plans with an experienced course advisor face to face. In an increasingly virtual world, we know our clients value speaking to real people, getting open and honest advice. The vast majority of our clients are British, and our office and outdoor store is based in Windermere in the English Lake District. Get in contact to arrange a meeting, and come in for a coffee to discuss your course in person with a trip advisor.